FOR someone in love with outdoor life and wanting to witness the beauty and grandeur of nature at its best, possibly nothing equals a holiday in Norway. Ideally, a week’s holiday between mid-May and early August when twilight lingers through the night in southern Norway, and the sun doesn’t set for weeks on end in its northern regions — the land of the midnight sun. Over a hundred thousand tourists annually visit Nordkapp, the most northerly plateau, to see the exotic phenomenon. People go in cars, sleep in campers, and get up to watch the midnight sun — and eat Danish pastries. What strikes one most about Norway is its incredible natural beauty; exemplified by rolling farmlands, sunlit beaches, enchanted conifer forests, bleak alpine plateaus, dramatic glaciers, and the breathtaking fjords. The country boasts pleasant modern cities, rustic fishing villages, hundreds of worthwhile museums and rich historic sites ranging from restored Viking ships to medieval churches. This extraordinarily extended piece of land resembling a fish, with its tail flapping in the Arctic Ocean and a bulging head with a wide-open mouth in the south, is 3,000-km-long but as narrow as 6.5 km in the middle. With only 13 people to each square mile, the 4.5 million inhabitants enjoy a whole lot of breathing space. No wonder Norwegians are outdoor enthusiasts, fond of hiking, mountaineering, fishing, boating, and skiing. ‘Ski’ is a Norwegian word, and Norwegians make a credible claim to having invented the sport. And they stay foremost among nations in being environmentally sensitive: strictly regulating industrial waste and meticulously recycling household garbage. Norway has built an extensive network of roads and train tracks, affording access to remote areas. This network is backed by thousands of tunnels to safeguard against blockage by winter snow. But then whenever the view gets truly spectacular, the road or railway dives into a tunnel. To see the best of Norwegian scenery, plan on a few good stiff climbs on foot. Oslo, the usual first stop, no way matches top European capitals in grandeur or size. Yet you’re charmed with its compactness and elegance, cleanliness and style. The city can best be savoured by leisurely walking, especially on the main Karl Johan street between the modernistic railway station and the yellow royal palace. The whole stretch abounds in speciality shops, eating establishments overflowing onto pavements, masses of tulips and pansies on roadside, umpteen fountains, and an array of stately buildings. And the handsome tall Norwegians (average male height 5/10) are so calm and friendly. Your person and belongings are safer in Norway than at home. Unaccompanied women travellers have few worries. Added to this is the advantage of everyone around able to understand, speak English. What appealed to us, particularly, was the prevailing quietness of the place, more so having come directly from Delhi. No honking, no other noises of any sort. Nobody speaking loudly. In the beginning, it seemed so unreal. 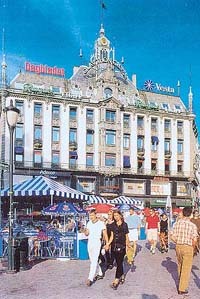 Another interesting area to walk in Oslo is the central seafront; a large busy square with imposing buildings in the background. Ferries are going out and coming in from various points. From here we took a short boat ride to Bygdoy peninsula. That contains an open-air folk museum; excavated Viking ships; Thor Heyerdahl’s raft, the Kon-Tiki; and the Fram polar exploration ship. Unfortunately, we rushed through the sights. Allotting a few extra hours can be more rewarding. 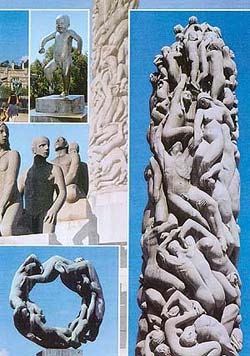 The highlight of Oslo sightseeing is a visit to the Vigeland Park. The grand park sports nearly 200 granite and bronze works of the Norwegian sculptor Gustav Vigeland (1869-1943). His highly charged work, which takes in the entire range of human emotional extremes — from entwined lovers and tranquil elderly couples to scenes of anger and despised beggars. A monolithic granite pillar crowns the park’s highest hill, portraying a mass of writhing human forms, both entwined with and undermining others to reach the top. Viewing this column in detail can be an unforgettable experience. 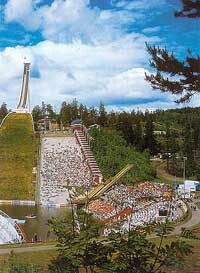 It’s fun to make a trip to the Holmenkollen ski jump, perched on a hilltop overlooking Oslo. It offers a panoramic view of the city. During Oslo’s annual ski festival in March, the site draws the world’s top ski jumpers. After a couple of days in Oslo, you can take a trip on the Oslo-Bergen railway. The 470-km-long route between Oslo and Bergen is one of the world’s finest train journeys, passing between snowy peaks and ice-covered plateaus. And don’t miss the side trip on the Flam line. This is a special train that starts midway from Myrdal and goes down to the dark green Flam valley, negotiating hairpins. In the way you see glorious waterfalls, with sheets of water thundering down from snow-clad mountain tops. A popular attraction during the side trip is to take a cruise on the Aurlandfjord, one of the longest fjords coming into the land. You come across sights of unbelievable beauty and majesty as you pass through perpendicular rock faces on both sides, with their shimmering waterfalls. Bergen, once the capital of Norway, is a colourful, historic town; Norway’s most-visited and best-loved town, Only it rains there about 250 days in a year. If you happen to hit Bergen on a sunny day, you are assured a whale of a time in this delightfully picturesque place. And then the fjords on the western coast. Nothing typifies Norway more than its fjords, which are the top attraction for visitors. In the most frequented Western fjords region, Geirangerfjord has perhaps the most spectacular waterfalls. If you have the time and money, you can take the popular trip on the Hurtigruta coastal express, an adventure in itself. The luxury ship takes you on the world’s most beautiful coastal route from Bergen to Kirkenes through narrow straits and over the open sea, past rock islands and cliffs, stopping at several ports of call. Some rate the voyage superior to the famed Alaska cruise in terms of natural scenery. Norway has this advantage: though at the same latitude as Alaska, the weather on its coastal ports stays milder, thanks to the Gulf Stream. By international standards, Norwegian food is fairly bland. Happily, with the coming of immigrants, restaurants have sprung up offering all sorts of cuisine: Chinese, Japanese, Indian, Thai. If Norway has a national drink, it’s coffee, and it’s drunk-in such staggering quantities that one can only wonder how people can remain so calm under the influence of so much caffeine. Most Norwegians drink coffee black and strong, but we were always able to get cream and sugar to add. For a powerful dose of Norwegian culture, don’t miss the national spirit, aquavit (water of life) which is a potent potato and caraway liquor. Norwegians often gulp it in small doses laced with beer. Norway isn’t known for its nightlife. And, unlike Denmark and Sweden, operates a strict control over the import and display of pornographic material (no Swedish sin for Norway). We were lucky, we happened to be in Oslo on May 17, the national day. We witnessed masses of joyful people taking to streets in traditional dress. Marching bands and thousands of schoolchildren parading down Karl Johans Gate to the royal palace. Suggested itinerary: Three days in Oslo; two in Bergen with another day in-between amidst the Flam valley and the inland cruise among fjords. The Norwegian krone is currently around 9 to a US $. English, is widely spoken, even in rural areas. However, it’s still a good idea to learn a few Norwegian phrases. The most used one is var sa god (pronounced as var sho Goot). This carries all sorts of expressions of goodwill, such as goodbye, welcome, good day, thanks, and other greetings.